On the face of it, this is extremely good news. What is worrying, though, is that it was eventually blocked by German, with London and Paris said to be in favour of the merger. That says very little for Mr Cameron's supposed supposed commitment to a change of relationship with "Europe". 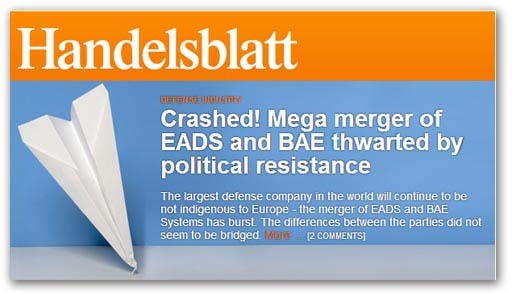 The EADS/BAE Systems merger is the stuff of dreams for Brussels. For Britain it would have effectively eliminated defence sovereignty. It also makes you wonder about the true intentions of Germany and, at its very heart, how committed it is to European political integration. This was a golden opportunity to progress the defence integration agenda, creating a massive, pan-European arms maker, yet apparently Merkel took a hand in forcing the bid to be rejected. Even then, one wonders whether this represents a rejection of European "values", or is Germany's bid to keep UK interests out of the loop. There is also a suggestion that Germany is a little bit uneasy about recent Anglo-French defence initiatives, and has seen the current merger as a Franco-British takeover of German interests, with France likely to come out as top chien. Any which way, Handelsblatt is pronouncing everybody a loser, but since that also includes "European unity", there has to be a winner somewhere, even if no one wants to put a name to it. It's called national interest.